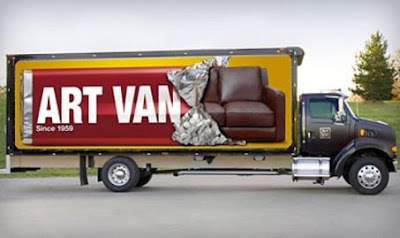 Hat Tip to Marty Schwimmer for posting the complaint filed by Hershey Company (“Hershey”) against Art Van Furniture (“Art Van”), a Michigan furniture company over its use of the above picture on its furniture trucks as well as the somewhat surprising decision by the court to grant a temporary restraining order on the basis of dilution. See Hershey Company et al v. Art Van Furniture, Inc., Case No. 08-cv-14463 (E.D. Mich. Filed October 21, 2008). Reports on the actions of the parties leading up to the lawsuit have been published by the AP and The Detroit New. Most of the court’s decision is spent analyzing, and ultimately rejecting (ed.—rightly so), a likelihood of success on the merits for Hershey’s trademark/trade dress infringement claims given the balance of the likelihood of confusion factors favoring Art Van. However, the court then, with a relatively brief analysis of Hershey’s trademark dilution claim, concludes that Hershey has established a likelihood of success on the merits for a claim of trademark dilution by blurring. 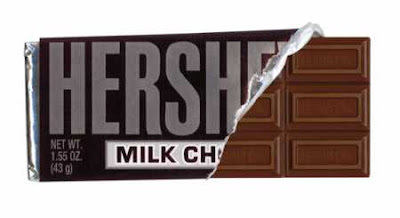 Granted, Hershey had the advantage in meeting the primary elements necessary to show dilution under 15 U.S.C. §1125(c) – specifically a famous and distinctive trademark in the nature of the Hershey’s candy bar trade dress, use of the Art Van ad by Art Van after Hershey’s trade dress became famous, and a similarity between the Art Van ad and Hershey’s trade dress that gives rise to an association between Hershey’s trade dress (Comment: Based on the pictures above, I’m not so sure I would agree with the court's finding that Art’s candy bar would give rise to an association with Hershey’s candy bar). As for whether such association is likely to impair the distinctiveness of the famous mark, when you start to analyze the six factors set forth in 15 U.S.C. § 1125(c)(2)(B) that courts consider in deciding if a junior mark is likely to dilute a famous mark through blurring (degree of similarity, degree of inherent or acquired distinctiveness of the famous mark, exclusive use of famous mark, degree of recognition, intent to create an association with the famous mark, and any actual association), they tend to favor Hershey’s as well (comment--although again, I’m not sure I agree with the degree of similarity in this case). But what I found curiously odd was the court’s short shrift of Art Van’s parody defense. Naturally, as support for its argument that its use was protected by parody, Art Van cited to the last year’s “Chewy Vuitton” decision in Louis Vuitton Malletier S.A. v. Haute Diggity Dog, LLC, 507 F.3d 252, 260 (4th Cir. 2007), which rejected a dilution cause of action by Louis Vuitton against the makers of “Chewy Vuitton” dog toys. The [Louis Vuitton] court dismissed the plaintiff’s infringement and dilution claims; there was no mistaking the intentional, yet irreverent nature of the defendant’s miniature handbags. Id. at 260-61. “It is a matter of common sense that the strength of a famous mark allows consumers immediately to perceive the target of the parody, while simultaneously allowing them to recognize the changes to the mark that make the parody funny or biting.” Id. at 261. Defendant’s “couch bar” may be funny, but it is not biting; its resemblance to Plaintiff’s famous trade dress is too muted to poke fun, yet too transparent to evoke a generic candy bar. An important theme running through Louis Vuitton is that, while a parody may be nearly identical to the original in some respects, in others it is so different that no one could possibly mistake it for the real thing. Id. Defendant’s design is neither similar nor different enough to convey a satirical message. So there is no mistaking that a dog toy that sells under the name “Chewy Vuitton” and made to look like (and yet obviously not be) a mini “Louis Vuitton” purse is so intentionally irreverent that it constitutes a parody – yet a sign on a furniture truck showing a brown couch emerging from a candy bar wrapper that looks somewhat like a Hershey candy bar wrapper is not irreverent? Surprisingly, the key appears to be "somewhat like a Hershey candy bar." Basically, the court is saying that Art Van’s ad, while capturing an image that consumers would associate with Hershey’s trade dress, is not so strong enough that Art Van can claim it to be a parody of Hershey’s trade dress. The court uses the word “biting” although I’m not so sure I would call a “Chewy Vuitton” dog toy a “biting” parody (although I’m sure there are numerous dogs out there that find such toys quite “biting”). While I’m not so sure I agree with the court’s decision that Art Van’s ad is not “biting” enough (i.e., neither similar nor different enough to convey a satirical message), the lesson learned is that if you are going to parody a famous mark, you had better make sure that you go all out to not only make an obvious association with the famous mark, but also to make an obvious disassociation with the famous mark. Apparently, if you attempt to parody a Hershey bar, but it’s not clear enough that you are parodying an actual Hershey bar, then such ad, while apparently sufficient for dilution purposes with respect to such Hershey bar, is insufficient for parody purposes. One wonders if the court would have decided the parody issue differently had the lettering more closely resembled the Hershey candy bar lettering (or even used a word like “Couchey’s” inpace of “Hershey's” and then “Fine Furniture” instead of “Milk Chocolate”) and had the color of the candy bar looked more like the famous dark brown color of a Hershey bar? What is the point where Art Van’s ad would have been intentionally irreverent enough to constitute a parody?